We were headed across Ireland to have dinner with Anthony Murphy, author and archaeoastronomer. Arguably one of the best things I did in Ireland this summer and well worth the thirteen hour investment. Actually, I was driving and Jack was navigating. Ostensively to avoid the three dollar toll on the cross country motorway, but clearly to afford Jack the opportunity to gaze out the window at ringforts as we passed through the countryside. He makes this drive frequently, but never as a passenger. And he observed loads of them. I would later learn that there are an estimated 45,000 ringforts in Ireland. Add to that 3,000 holy wells, 1,400 cairn temples and 234 stone circles. Add to that numerous but uncounted standing stones, dolmans and remains of stone sweat lodges. For a small country, Ireland has a massive number of megalithic and ancient sacred sites. Small by comparison I suppose. In terms of square miles it’s about the size of the state of Maine and half the size of Washington state. Every time I travel to Ireland I come away with new insights and deeper understanding. Although I always spend time at various individual sites, it was the comprehensive megalithic landscape that got my attention this year. Perhaps the influence of meeting Anthony who has authored two excellent books on the megaliths of the Boyne Valley. 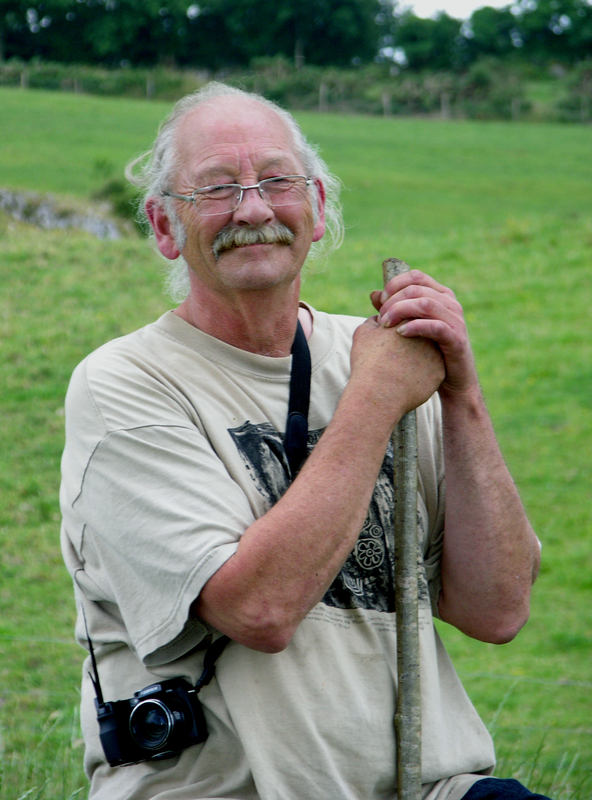 Perhaps the influence of hanging out with Jack (the man in the photo), a dear friend who just last week published yet another book on stone circles, this one the most detailed and definitive book available on the subject – I had the chance to proofread it while I was there. What hit me this year was the reflection of what it must be like to live in this landscape. For indeed these sites are everywhere, seemingly around every corner. So omnipresent. Sharing this reflection with a few folks on my return has elicited interesting response. One person pushed back a bit on the notion of a sacred landscape being so very unique, citing the number of religious sites to be found in communities in the New England area. Another pushed back citing recent discoveries of yet more indigenous American artifacts. Both true. However at 5,000 years Ireland’s megalithic sites are considerably older than religious sites in New England. And for those of us who are not indigenous American, those artifacts are not of our heritage. Therein lies the significance. Deep and profound significance.